Quite a few years ago, Phil bought me a Garmin Forerunner 110 for a birthday gift to help me track and record my runs. I was training for my first half-marathon, and when the training schedule called for, say, an 8 mile run, I would have to drive a route to figure out the distance I needed to run that day. Having a fitness tracker that could not only figure out my distance while running, but also give me my pace was amazing. It seemed so futuristic! I could plug in the Garmin to my computer and it would download my run complete with pace per mile, map of the route I just ran, and I could keep track easily. A few years later, Phil bought me a Fitbit Charge for Christmas (can you see a trend in his gift giving prowess?) and I loved it. It was sleeker than the Garmin, and tracked my steps all day long, as well as my heart rate and calories burned, even my sleep! It was fun to have access to more information about my body, and I liked being competitive with myself each day. 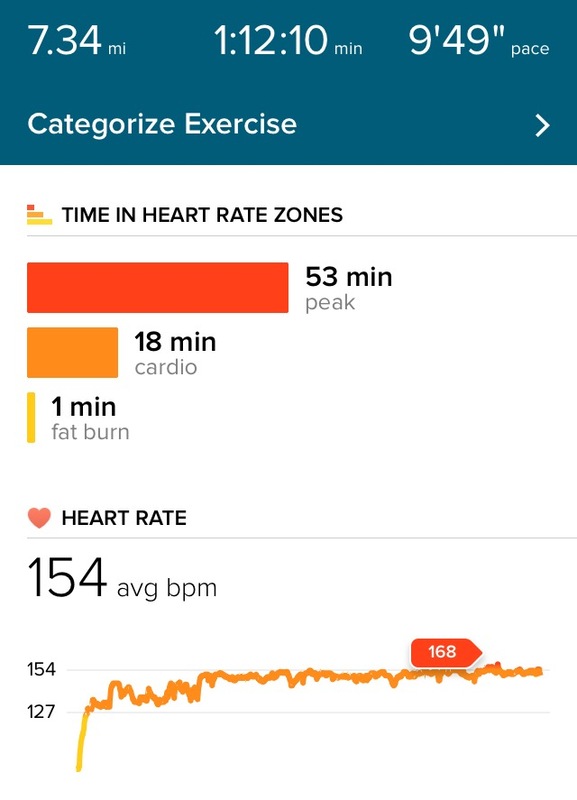 The band on the Fitbit Charge eventually broke, and Fitbit sent me a coupon for 25% off my next Fitbit, so I looked around and chose the Fitbit Blaze. This one is really great to use and I love everything about it except it's a little large, much like the Garmin. OK, Colleen, we've heard enough about your fitness band experience, what's your point? Geesh, Colleen, I'm getting there. Have patience, have patience, don't be in such a hurry. For when you're impatient, you'll only start to worry. Anyway....I've been wearing said Fitbit Blaze daily (I actually forgot to put it on one day and felt so naked and wanted to leave work all day to go get it) and whenever I go for a run it says my average pace is about 10:00 - 10:20 per mile. I was very sad by how slow I'd gotten, but I chalked it up to having a seventh baby, turning 38, having baby weight to lose, etc. However, I could run a lot faster on the treadmill went I did my interval runs and whenever Phil and I ran together, both wearing our matching Fitbit Blazes (aren't we cute?) his would always track a longer distance than mine. So if mine said we ran 5.5 miles, his said 6 miles. We were running together a lot (thank you teenage babysitters!) and so I just went by what his Fitbit said was our mileage. Then one day, I fell and scratched up my knees and hands pretty bad, and after that felt nervous to run alone. It was starting to become an anxiety trigger so I knew I needed to start running alone again before it got to the point where I couldn't do it. In an effort to push myself out the door alone, I decided to dust off the old Garmin to be able to track my mileage more accurately than my Fitbit does. I started out my run and when my Garmin beeped, I looked down and was pleased to see an 8:57 mile. The second mile clocked in at 8:38. I felt so great running at this pace, and decided to make it a long run because Phil was home, the little kids were napping and it was a gorgeous running day. Plus I had on my new (maybe favorite?!?!) running pants that completely hold in my mummytummy and stay in place. Life was good. How many things can I fit on one wrist? Which one is correct? I'll take a longer run with a faster pace for $200, Alex. So what's a runner to do? Well, I guess this runner will continue to wear the Fitbit all the time and also wear the Garmin during a run. That way I can keep track of my steps all day long on the Fitbit but also have an accurate record of my runs in case I want to start training for a half-marathon again (spoiler alert...I do!) . Maybe there's a product out there that is more accurate and also user friendly for daily wear, like this one? But I really don't want to buy yet another fitness tracker, I think two puts me on the certifiable level already! You mean there's a chance my iphone is recording my pace wrong??? Because I'm pretty damn slow. I would trust the garmin on the anecdotal notion that it's an older, more reputable brand and fitbit churns out new models at pretty affordable prices. The fitbit is probably not as good, is my guess. You might be a lot faster than you think!!! I feel like the Garmin is more accurate. When I was running, I had a Garmin Forerunner and I know the mileage was accurate because I drove my route with the car before I got my Garmin. And the Garmin matched the car. Also, I ran a local 5k one time with my Garmin and my time was fabulous. I had gone crazy fast according to my time until I realized after checking the miles that it wasn't a full 5k according to my Garmin. Boo. Plus, isnt' the fit bit going off of arm movement while the Garmin is going off GPS? The Fitbit Blaze that I currently have does use GPS, but I still think the Garmin is way more accurate. And I want it to be more accurate! Ah that’s so frustrating! Although at least you are a lot faster than you thought and not the other way around! I just use the Nike running app on my phone.. I wonder how accurate it is?? !